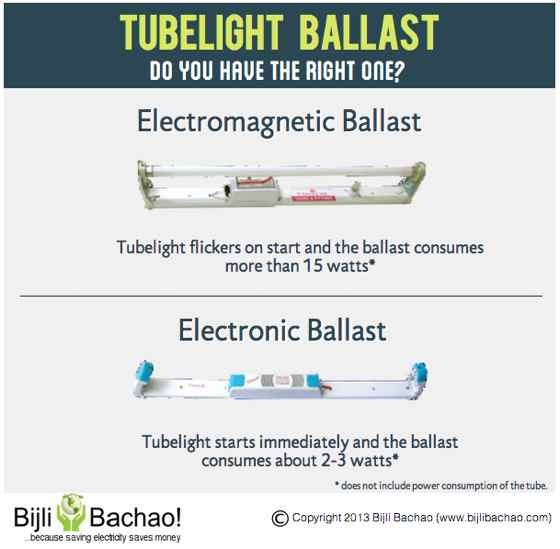 We at Bijli Bachao are big proponents of T5 fluorescent tubelights. Of all the lighting options that are available in the market currently, T5 tubes provide the best “bang for the buck” or value for money. Their output (brightness) per watts is much more than that of CFLs and they are quite cheap as compared to LED luminaires. On top of that they have decent life. Because of all these benefits, we have always been recommending using T5 tube lights to everyone. During a recent interaction when we were helping a friend purchase a T5 tubelight we realized that the number of options available in T5 tubes is a little confusing for the buyers. So here is the article that provides some details for buying a T5 tubelight. What is a T5 tubelight? 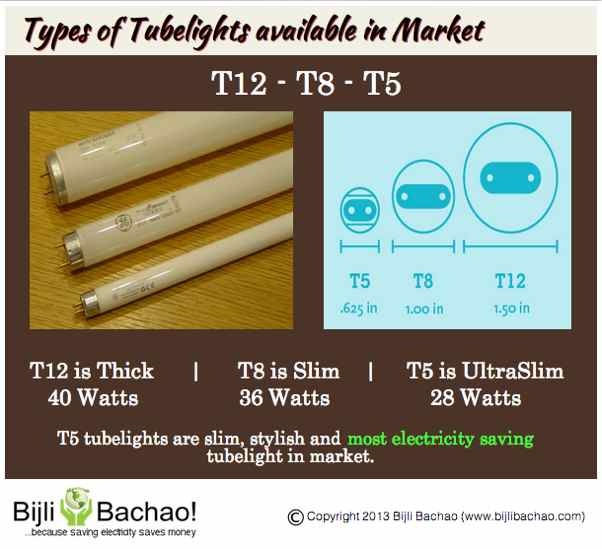 T12, T8 and T5 are naming convention for tubelights where “12” is the thickest and “5” is the slimmest tubelight. T12s were quite popular in the past (some 10-15 years back). They were replaced with slimmer T8 version, which are the most popular and easily available version today. But T5 is the most efficient (energy saving) option that is available in the market today. It is approximately as thick as a thumb. As this is a relatively new technology, you may find it difficult to get them in the market. But if you are really interested in saving electricity, insist on getting T5 tubelights. 4 ft tube with power consumption of 54 watts: These are the brightest of all options available and give light output equivalent to 2 regular tubelights (36 W T8). 4 ft tube with power consumption of 28 watts: These are the direct replacement of any regular T8 tube light and give similar brightness while consuming less electricity. 2 ft tube with power consumption of 14 watts: These give half the amount of brightness as compared to regular tubelight. These are good for smaller rooms where light requirement is less or are less visited. Some people also use them in bathrooms that require more brightness. These provide more brightness (almost double) as compared to a 14 watt CFL. 1 ft tube with power consumption of 8 watts: These are the smallest option available and are good for small use (places where only visibility is required). Their brightness output is one fourth of a regular tubelight. They can also be used in smaller rooms if light is just required for visibility. Note: Please always insist on buying a T5 with aluminum frame because the plastic frame may break before the end of life of a T5 tube. With aluminum frame one just needs to replace the tube by end of its life as compared to replacing the whole set (frame + tube) in case of plastic frames. Most T5 tube lights cost between Rs 350-650 (negotiate if you are charged more), which is expensive as compared to a regular tube light. But their payback (by savings in electricity) happens in 6 months to 1 year if it is used daily in the evening for 4-6 hours at least. And they last for about 3 years. So it provides 2 years of savings if replaced for regular tube light. Also the initial cost is high because T5 tube light needs a different kind of frame as compared to T8 tubelights. But once installed, replacement tube (just the tube) costs much less (about Rs 100-150). We have written about this in detail in another article: link. Do not treat CFLs are replacement of tubelights as they are brighter and cover more area. A T5 tubelight is the best option available in the market for general lighting.